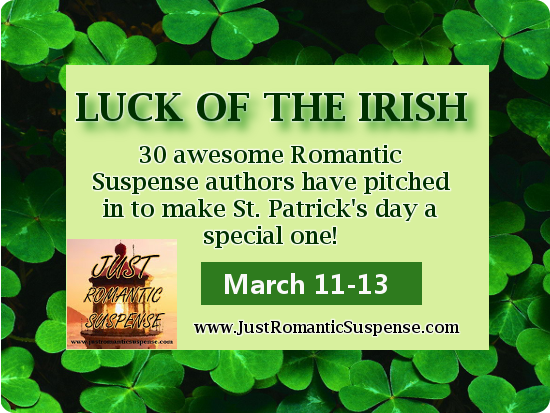 Just Romantic Suspense: JRS LUCK OF THE IRISH Giveaway! JRS LUCK OF THE IRISH Giveaway! Congratulations to "Debbie O. ", our Grand Prize winner, and our runners-up, "Debra G." and "Maureen Mc." Thank you to all who participated! From March 11 -13 everyone has an opportunity to experience the LUCK OF THE IRISH on JUST ROMANTIC SUSPENSE! On March 14th, one grand prize winner will be able to select 10 titles of their choice from the Pot Of Gold. My favorite green item is Granny Smith apples. My favorite green items are grass and trees in the spring after a long cold winter. My favorite green item is green beans! Our jade plant is a favorite of mine. My favorite is a green crystal angel with green jewels on the wings and holding a three-leaf clover. I used to have a clover necklace that was dipped to preserve it, but i don't remember what happened to it. My favorite green item has to be a Christmas tree. I love the season, the decorations, the lights, the good food, the presents, and the smell of pine that comes from the tree. I have a necklace my husband gave me that has green gems in it that I love. That is my fave green item. Green grass coming up after a brutal winter ~ Awesome giveaway ~ Happy St. Paddy's! My favorite green item is four leaf clovers. I love searching for them. My favorite green item is the light-weight jacket that I am wearing right now. Once I switch to this jacket I feel as if winter is over and spring has begun! Happy upcoming St. Patty's Day! :) My fav green item... I will say two things I love are my green bears (especially the one my little nephew gave me that has a shamrock shirt) and my shamrock wind chime! Hmm, money is green! I love racing, so I'll say my favorite green thing is the green flag that signifies that start of the race! A CareBear from when my daughter was a child. It's green with a shamrock on it;s belly. My favorite green item is an emerald ring my husband gave me for one of my birthdays. My favorite green is Mt Dew! my glasses. they're fluorescent green on the inside and black on the outside. totes cool. My favorite green item is my emerald ring which is my son's birthstone. My favorite green is a jade necklace. an "erin" bear beanie baby that I've had since high school. Someone gave it to me when I was very sick and my mom was more tickled than me at the time :) And yet I've kept it. Thanks for sharing! My favorite is the green sweater I'm wearing today. While crayon green was once my favorite color (now it's crayon yellow), I have very little that is green. I would say my favorite green things are green M&Ms (and not for their supposed aphrodisiac properties) and my cats' eyes, all three have green eyes. My favorite green things are the tiny stalks of my bulb flowers poking through the ground signaling Spring is here! My favorite green item is lettuce. I think I am going through withdrawal because I haven't been able to get any decent lettuce for several months. My favorite green items are my eyes. Or a box of hundred dollar bills. One of those. My favorite green thing that is green is my eyes! My birthstone is peridot. Love emeralds also. Green grass (can't wait for summer). My favorite green item is a lovely scarf that was given to me by a former international student. My favorite is my shamrock plants I received from a friend who has now passed away. My son's eyes and my birthstone (peridot) ! My favorite thing that is green is my sons eyes! I have nothing green so I guess I would say money. I love Amazon parrots, which are green. My Hosta plants! Every spring and summer, my hostas blooming are so exciting to watch. They are so lush, huge and just so gorgeously green! I cannot wait until they explode from the yard with their beauty! Love the green grass and leaves on the trees! Means it is spring! Ooh, nice, there's lots of digital options as well! I prefer reading on my Kindle to actual physical books now. Asparagus is my favorite green veggie! I think my favourite green is the green of spring. Its been a long winter and I am looking forward to green grass and green leaves!